There’s a lot more to trust than delivering on your promises. This much became clear when this week I shared a quote from one of my CEO interviews on social media. The quote was ‘Trustworthiness is about doing what you say you are going to do’. Quickly, readers jumped in and said ‘Yes, that’s part of trust, but it is not the whole story’. Barbara Brooks Kimmel, CEO and Co-Founder of Trust Across America’, captured the point succinctly when she said, ‘Hit men deliver on their promises, but I am not sure we’d say they were trustworthy individuals’. So what more is there to trust than doing what you say you’re going to do? The academic research in this field suggests that trustworthiness is made up of three components: ability, integrity and benevolence. Furthermore, trustworthiness = ability x integrity x benevolence, so even if you are delivering your promises day in and day out, if you are also dishonest or cruel then I am unlikely to trust you. 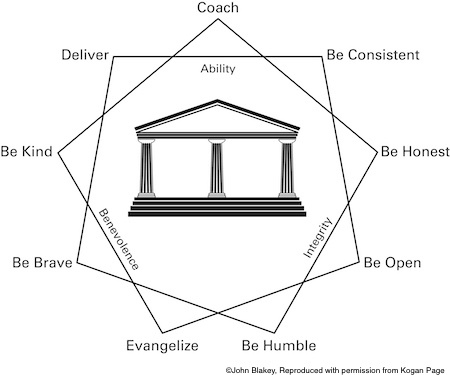 The diagram above further puts into perspective that the habit of delivery is only one of nine habits that are necessary to inspire trust in those you lead. Crudely expressed as a percentage, this model suggests delivery is only 11.1% of what it takes to be a trusted executive, yet I imagine most CEOs think instinctively that it is 80% of the answer. That could prove an expensive error of judgement when developing plans to build a trustworthy reputation, whether that be at the level of the individual, the team or the organisation. Can you also help others deliver on their promises (coaching)? Are you honest, open and humble (integrity)? Do you make personal sacrifices for the wider good (moral bravery)? Do you share the good news of your vision passionately and consistently come sun or rain (evangelism)? Do you go above and beyond the profit motive to deliver random acts of kindness to your stakeholders (kindness)? These are the tough questions that face leaders who are looking to build trust in a world where nothing can be hidden, no one gives you the benefit of the doubt and where, through social media, everyone has a powerful voice. As one of my interviewees put it, ‘the industrial revolution empowered companies, the social revolution is empowering individuals’. This one simple truth explains why, in the modern world, there are at least eight reasons why trust is not as simple as delivering on your promises. The challenge for all business leaders is to work out whether they and their organisations have fully worked through the ‘wall to wall’ implications of this shattering truth. If not, they too may sleepwalk into the same trust crises that, in recent years, have engulfed household names such as BP, Barclays Bank, the BBC, FIFA, Tesco and Volkswagen. John will be exploring the nine habits that inspire trust in his forthcoming book, ‘The Trusted Executive: Nine leadership habits that inspire results, relationships and reputation’. You can pre-order now via Amazon.